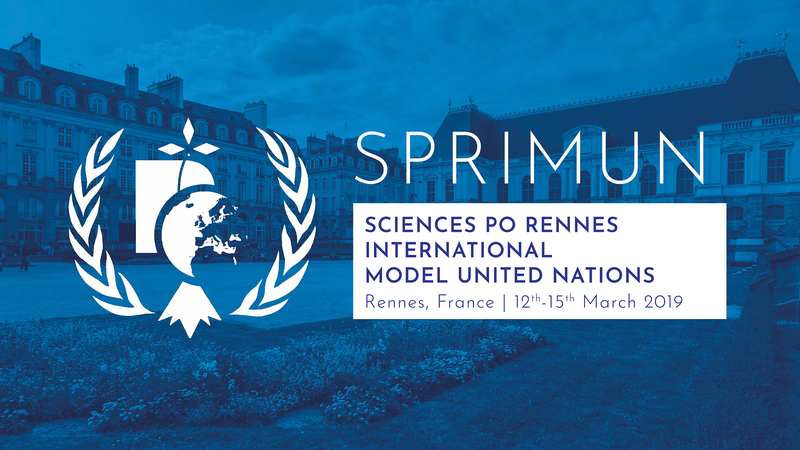 It’s the first day at the Science Po Rennes International Model United Nations at the Espace Ouest-France, and the Disarmament and International Security Committee has just finished the roll call. The two topics presented are preventing an arms race in outer space and regulating the use of unconventional weapons. The chair opens the floor to the delegates and Russia immediately motions to discuss the first topic: the arms race in space. Even this decision, which can never be avoided, only prolonged is met with dissent as Israel and Kazakhstan argue that it is more prudent to discuss the unconventional weapons topic first for no other reason than that they feel it is more important for the security of their respective states. However China believes the arms race in space is important and the motion to discuss the first topic first is passed with a clear majority. There are a few general speakers on the topic. Japan, the United States of America, India, and the United Kingdoms are all in agreement that every nation should try to develop a space program and that there should be international and intercontinental negotiations to help form broad intellectual cooperation between countries. However there are a few discrepancies in their arguments. Japan mentions their concern for space waste, the USA does not want a binding contract, India is focused on development, which for them greatly involves outer space, and the UK thinks that everyone should have the right to use space for scientific and economic purposes. Only Iran has doubts of an international space program and is worried about certain countries, specifically the USA, and what secrets they might be keeping from other nations. China motions for a ten-minute moderated caucus, which is passed. In this time most of the countries present seem to agree that an international space agency would be beneficial to everyone. Even Iran consents to this plan but stresses, as did many other countries, that transparency should be paramount if this agency is to exist. The Ukraine proposes that it should be obligatory for participating nations to share information on present and future projects that concern outer space, however there is much dissent on this idea from the USA, China and the UK. Japan extends the caucus for five minutes and puts forth the idea that the agency could be a neutral space for information. Algeria agrees that transparency is necessary for this to work, but that treaties like this are hard to enforce. Another fifteen minute moderated caucus is passed in which Japan, Iran, and Korea push for transparency, but Israel, China, and Russia believe that countries should only have to share information with those countries that they choose to trust. Another ten-minute caucus begins in which India argues that not only should transparency be required, but also involvement should be mandatory to all nations who wish to enter outer space. The USA argues for an international code of conduct, but the details are unclear. Nevertheless every country that speaks but Israel agrees that there should be some sort of code of conduct. 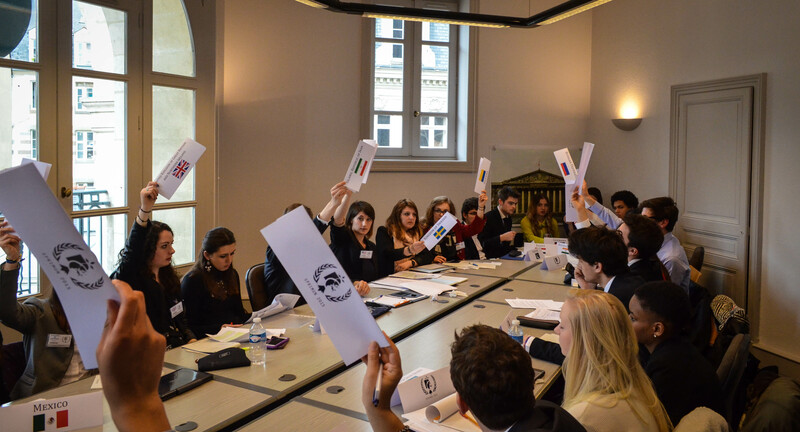 After a fifteen minute unmoderated caucus in which resolutions have begun to be drafted, there seem to be two sides to the debate that are both determined to work together. There are those countries like Russia who want a legally binding treaty, and those like the USA who believe that a non-binding contract is best to sustain peace. The session is ended with a twelve-minute caucus and will adjourn tomorrow to modify resolutions and continue the debate. Carmellita, representative of South Africa. Carmellita attends Science Po Rennes and is from an island off the coast of Madagascar that is a French territory. She decided to do SPRIMUN to see how the negotiations work and get the idea of a real United Nations project; this is her first MUN. In her opinion the conference is going well however some countries are presenting more on their own ideas than on the opinions of their respective countries. Rennes is a beautiful city, she says, and she knows the streets quite well from her studies here. As for her goals, Carmellita aims to work on the international treaties and meet and discuss with other countries on the topics at hand.